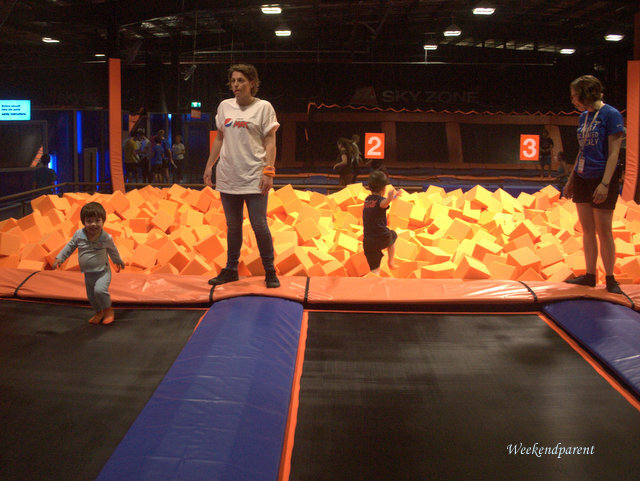 Where to take active kids in Canberra over the holidays — Sky Zone! 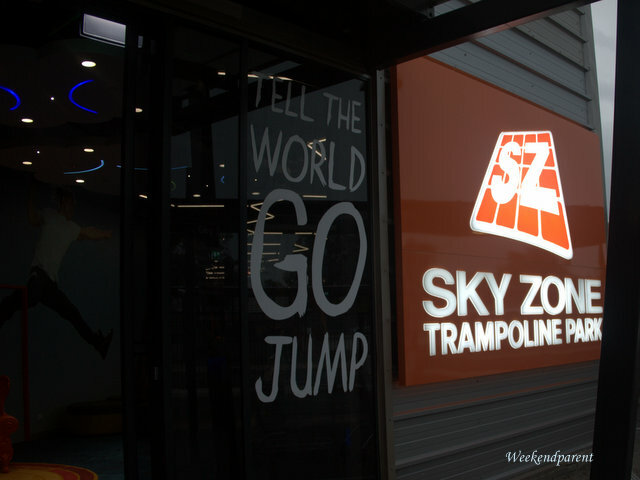 We were privileged to have a sneak peak at Sky Zone before its grand opening at the Belconnen Mall, Canberra, last week. 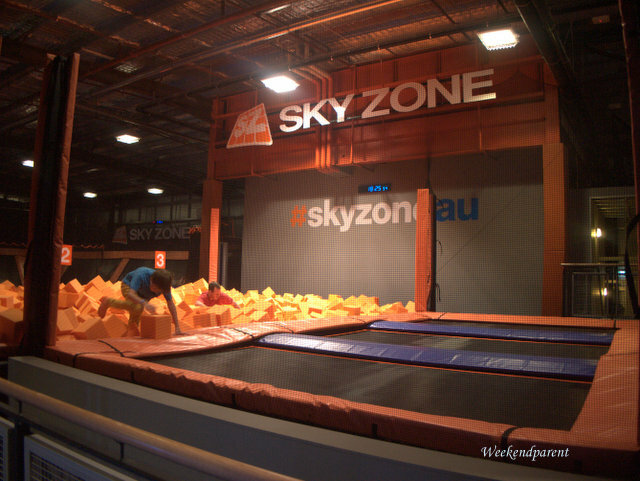 The Canberra Sky Zone is the third to have opened in Australia, and the first to debut in a shopping mall. Sky Zone is basically one big trampoline fun house. But it is much more than run of the mill back-yard trampolines. Firstly, there are a lot of trampolines. A serious lot of trampolines. During peak hours, staff will ensure that younger kids have a separate play area so that they are separate from older/more boisterous kids. Look at Little A go, go, go! He wanted to jump along with the big kids. My kids loved ‘the Pit’; you basically taking a flying run, jump jump jump, then free fall into a whole pit of orange foam. They were a bit nervous at first, but they got the hang of it pretty quickly. Towards the end, Big A kept pretending that he couldn’t get out because he didn’t want to go home. Apparently staff at Sky Zone find all sorts of things in the Pit when they clean it out — mobile phones, diamond rings, money. So make sure not to randomly leave valuables in your pocket when you make the jump of faith. 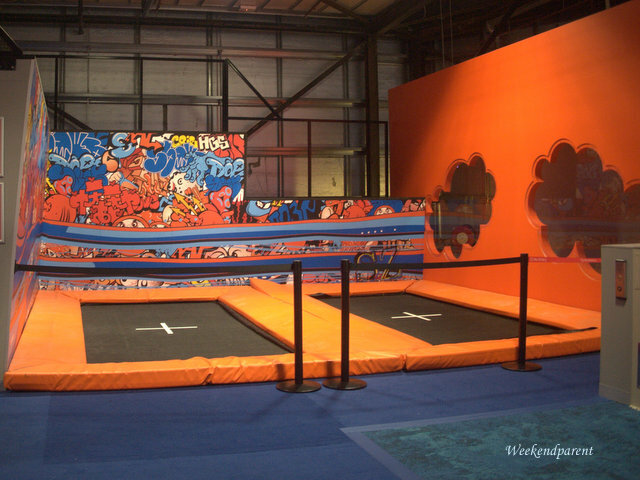 During the week, Sky Zone runs special sessions for small children. You can leave your kids with staff, who will entertain them with jumping and activities such as playing with foam noodles and colouring in. You can go and grab a coffee with friends, and return in an hours’ time. 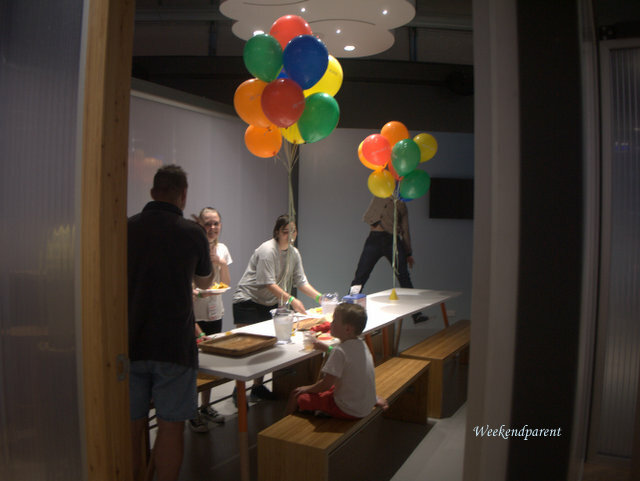 They also do children’s parties and have three dedicated party rooms. They were trialling a party when we visited, so we were able to have a sneak peak. It looked like fun. My boys LOVED their special Sky Zone socks. They thought they were the coolest things. The socks have special grips on the soles. Bring them back with you for a discount on entry the next time around. 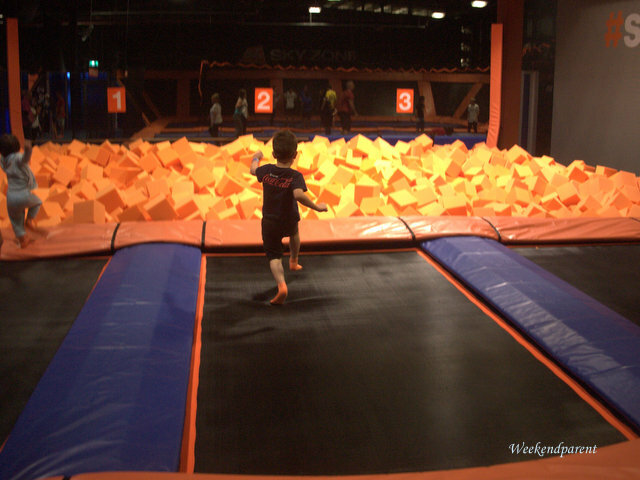 Since our visit, all I keep hearing is “can we go back back to Sky Zone, Mum?” I am labelling it “the Sky Zone effect”. The kids had a fantastic time, bouncing up and down using up lots of energy, and sleeping well afterwards. Apparently, trampoline bouncing is one the best ways to burn calories and keep fit — and also one of the most fun. 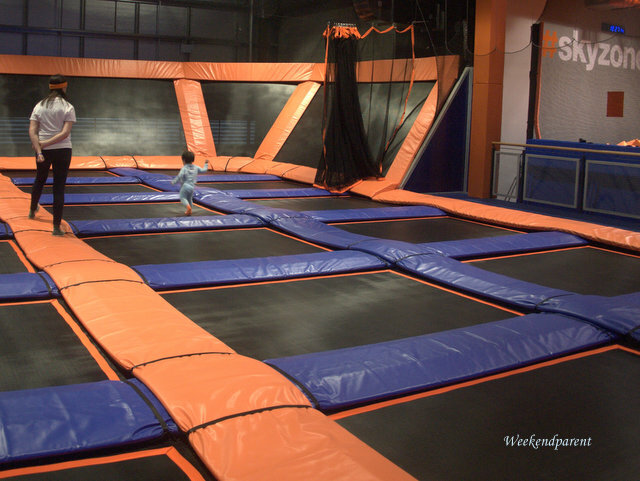 In its promotional material, Sky Zone notes that NASA’s research points to trampolining being 68% more efficient than jogging. I know which one I would prefer to do! Sky Zone also runs exercise classes — Sky Fit. So it is not surprising that Sky Zone is not just for children. It also runs corporate events, encourage it for fitness, and has a schedule of dodgeball fixtures. That’s right, dodgeball just like the movie. It turns out that a lot of people play it as a real sport. Feel like you could bounce of walls? Try ‘the Wall’, where you really can bounce off all the three walls — even that orange wall with the clear cloud feature. It takes a lot of skills, but some people have that daredevil edge. 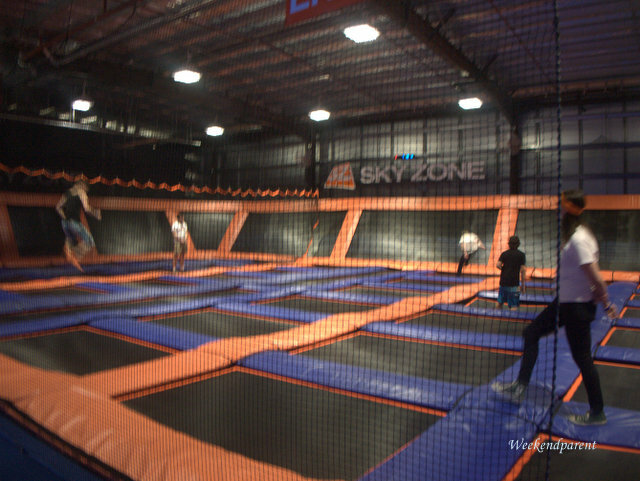 Sky Zone opened just over a week ago, and its facilities are still new and extremely clean. Staff were helpful and understanding about little toddlers wanting to explore. They have certain safety requirements, for example only one person per lane can use ‘the Pit’ at any one time. It impressed me as a professionally run operation, and somewhere I would feel comfortable bringing my kids again. Now that I think of it, the thought of dropping them off while I duck out for shopping and coffee does sound awfully good. 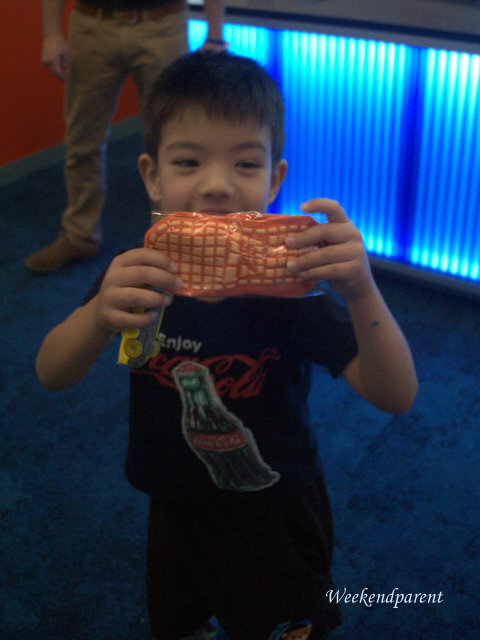 Weekendparent and kids were invited by Sky Zone to participate in a pre-opening trial.